Business Need: Many businesses have huge amount of data in their internal servers. With bring their own device (BYOD) trend, the workforce has become very mobile and employees want to access data from anywhere via their mobile devices. To improve productivity, organizations also want to provide secure remote access to the private corporate data. Allowing secure access to company wide data requires the enterprises to maintain the user and file permissions in their internal Active directory and NTFS. Enterprises are seeking a solution that can provide secure remote access to all their internal data while honoring internal permissions. VPN is a solution that is commonly used to provide remote access to data in corporate networks. Though VPNs are certainly popular, the design and security implementation for a VPN can be complex. Implementing a VPN requires highly skilled IT professionals with deep knowledge and a high level of understanding of public network security, data encryption and address encryption, etc. Even with VPN, it is extremely hard to access the files through mobile phones or tablet devices. For a small business that does not have the IT resources to implement and manage a VPN, there are several business file sharing options available that can meet the file access requirements. Moreover, securely sharing files with customers and partners is not possible using VPN, unless partners are in the VPN. Private cloud file sharing is gaining traction among enterprises to provide the option to access and share files online. On the other hand, Tonido FileCloud, a leading private cloud solution, provides an elegant and simple solution that could offer a powerful alternative for VPN. 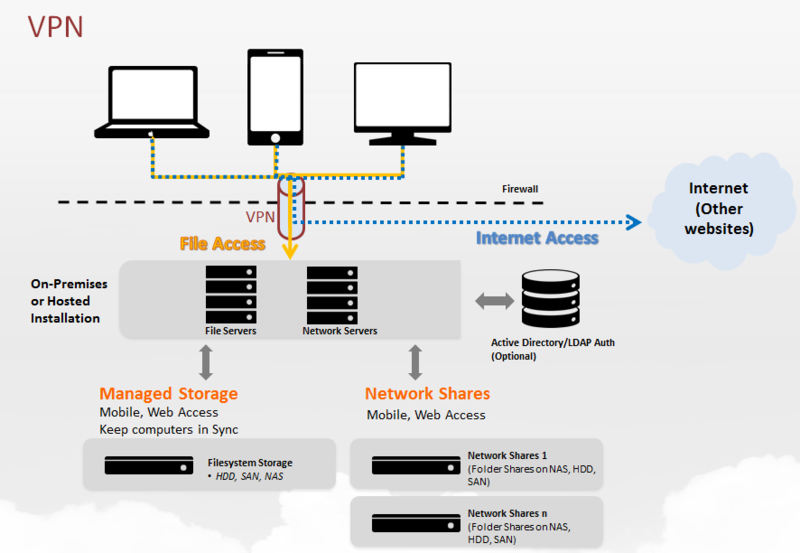 FileCloud is a private cloud file sharing solution that runs on Windows or Linux (alternatively, FileCloud can also be hosted in a 3rd party cloud). Once the FileCloud is installed, admins can import all the users from the Active directory. One of the key differentiating features of FileCloud is that it allows businesses to import all the legacy network share and ntfs permissions to FileCloud with a few clicks. With ntfs and active directory support, all internal permissions will be honored when users access their data from any device. Once the server is set up, users can access the files from the FileCloud server from any device using the URL, and userid/password. FileCloud doesn’t have any cumbersome setups and installations on client side, users can access the files using their browser. VPN is complex to install and it requires OS level software. Additionally, users need client software that needs to be installed and maintained on the user side. FileCloud doesn’t require any of these complex installation. FileCloud is simple to install, maintain and use. Installation and on-going management doesn’t require deep IT knowledge. Moreover, FileCloud’s simple user interface reduces overall effort and cost needed to educate and support multiple users. When one use VPN, all the internet access from the VPN connected device flows through internal servers, making it resource and infrastructure intensive. 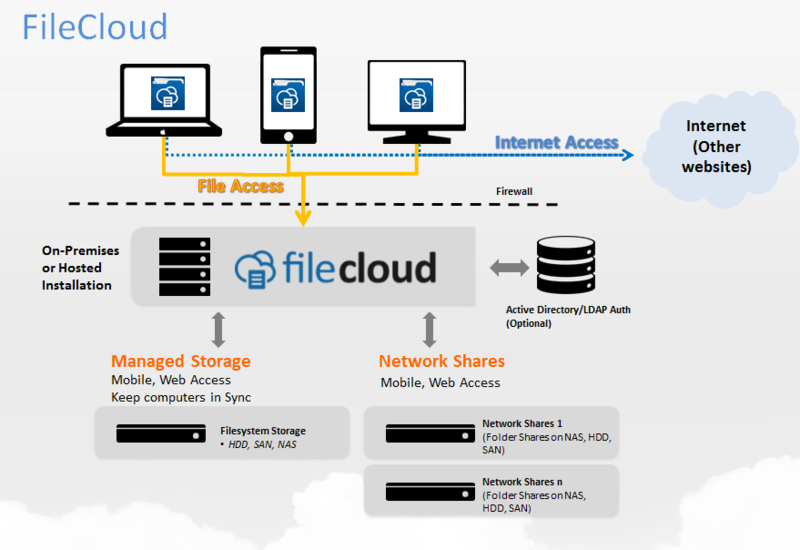 In contrast, FileCloud provides just the file access without the need to route all internet access from the device. Most of scenarios in any organization require a close collaboration with external customers and partners. 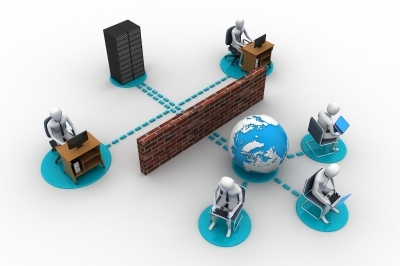 VPN provides remote access only to employees but doesn’t provide a way to securely share with partners and customers. FileCloud’s private cloud provides a secure way to share files with partners and customers without uploading files to external servers. Using VPN from a smartphone or tablet is extremely cumbersome. FileCloud has highly rated (4+ stars) apps across all major platforms iOS, Android and Windows Phone. These mobile apps makes access simple and delightful. To explore the features of Tonido FileCloud, please click here.